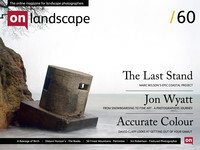 John Parminter has been in On Landscape before as featured photographer and was the first in our PDF issues. We are big fans of his original take on mountain photography and were pleased to hear about his foray into publishing. The book, "Scotland's Fifty Finest Mountains, A Photographic Exploration" is a great fit for John's ethos and approach. Choosing the top fifty was always going to be a challenge though and it sounds like this wasn't settled until just prior to print. We heard about John's book as it was just off the press when Dav Thomas was producing his "With Trees" book in Malta and Dav reported that it looked very fine indeed so it was with great pleasure that I received a copy of it within days of it arriving in the UK. This hardback book is modestly sized but landscape orientation instead of portrait, allowing some great panoramic full spread bleeds in a fashion that has become familiar to most fans of panoramic photography.